Passive solar design is a very effective and simple way to save money and minimize our biggest impact on the environment, buildings. To save most of the energy a building uses, apply passive solar design to heat it, as well as to cool, light, and ventilate it. By not requiring energy from fossil fuels and nuclear reactors, passive solar homes will save money, ensure your family’s comfort, and be less of a burden on the planet. 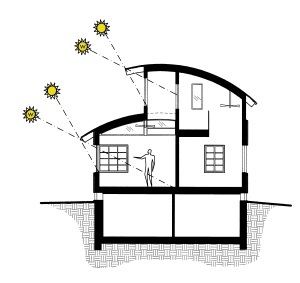 There are three key types of passive solar systems: direct gain, thermal storage walls, and sunspaces. Each of these systems has its own advantages. With direct gain systems, the house’s windows act as solar collectors and the walls and floors act as solar absorbers; this is why direct gain is the simplest and least expensive passive solar system. Thermal storage wall systems are good for rooms where you do not want as much light or where you want more privacy. Sunspace systems are great for additions to historic homes because you do not have to modify the home too much. These three systems can, and often should, be used on the same house. The most important passive solar design strategy is to get proper building orientation, especially making sure your site has good southern solar access and laying out the house so that its long side faces south. Another important strategy is to design solar shades so that they allow in the winter’s solar radiation and block the summer’s. The other essential strategies are getting proper thermal mass, glazing, ventilation, room arrangement, and daylighting. Insulation and air sealing are critical in any building. Use light-colored roofs, do not build more than you need, locate the home near where the occupants need to go, chose efficient appliances and lighting, and select local and green materials. Solar hot water and solar electric (PV) are great, but only for achieving what you cannot with less expensive passive solar design. If you want to save money, your health, and the planet―if you want a truly green home―use these simple passive solar systems and strategies in the design of your house. 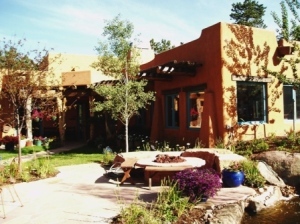 Given how simple and effective passive solar is to use in Colorado and the central Rocky Mountain states, it would be silly not to.